What is now Biggs Army Airfield started life in 1915 as an encampment at Fort Bliss, Texas for the 82nd Field Artillery. The next year aircraft of the 1st Aero Squadron used the field as a stopping point between San Antonio, Texas and Columbus, New Mexico, in response to Pancho Villa's raid on the small town. The field was referred to as "Fort Bliss Aviation Field". In 1919, the field was used for "Border Air Patrol". On January 5, 1925 the field was officially named "Biggs Field" after Lieutenant James B. "Buster" Biggs. Lt. Biggs was an El Paso native killed in a plane crash October 27, 1918 at Beltran, France. Between the two World Wars, Biggs served as a refueling stop for transient aircraft, but during World War Two it became a hub of training activity for B-17, B-24 and B-29 crews. The base came under the command of the 2nd Air Force and was headquarters for the 20th Bombardment Command. In 1945 a detachment of B-29s from the 16th Bombardment Operational Training Wing arrived at the base. With the end of WW II the 16th BOTW was deactivated and Biggs became home of the 19th Tactical Air Command, with the 20th Fighter Group and the 471st Air service group taking up residence. These last two units left Biggs for Shaw Field, South Carolina in 1948. 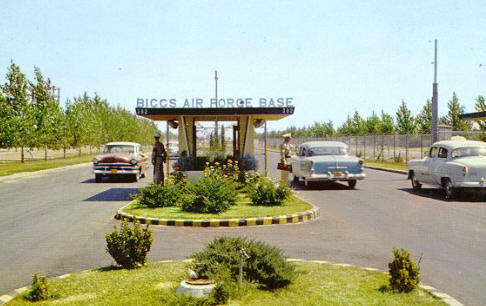 On February 1, Biggs Field became Biggs Air Force Base. The 47th Bomb Wing and the 544th Air Service group moved from Lake Charles, Louisiana in October of that year. The 47th only stayed until December, 1949, when it left for Barksdale AFB. Biggs AFB became a Strategic Air Command asset when the 97th Bomb Wing moved to the base from Smokey Hill AFB, Kansas, in May 1948. In 1950, the 1st Strategic Support Squadron was assigned to Biggs, and on June 10, 1952 the 95th Bomb Wing was activated. To administer the groups the 810th Air Division was also activated in June, 1952. During this time, the various units operated B-29s, B-50s, B-36s, B-47s, B-52s, C-97s, C-124s, KC-97s and KC-135s to name a few. From 1939 until 1966 one unit was based at Biggs, changing designations several times. That unit was at various times the 1st Tow Target Squadron, 6th TTS and finally the 4758th Defense System Evaluation Squadron. In its lifetime, the 4758th starting with a lone B-10 in 1939 operated at various times: A-26s (which the USAF redesignated B-26s), C-47s, T-6s, F-80s, B-29s, B-45s, B-57s and F-100s. The 1st SSS was deactivated in 1959, the 97th BW moved to Eaker AFB that same year and in 1966 the 95th BW was deactivated and the 4758th DSES moved to Holloman AF, NM. With that last action Biggs AFB closed and the airfield reverted to the U.S. Army where it once again became Biggs Army Airfield. USAF aircraft and units are only visitors now, but the U.S. Army maintains a small fleet of former USSR equipment: various helicopters including some Mi-24s and at least one An-2. Biggs is also host to the annual Amigo Airshow, which is usually held in October.